Chirping birds set a cheery mood and the sensation can be enhanced by adding bird dinnerware to your table, kitchen or dining room. Redecorating your kitchen or dining room with a bird theme is a great way to welcome a season into your home. After spring cleaning, the new, uplifting decor will give a sense of achievement. For hunters and wildlife lovers, there are collections of dinnerware that feature game birds. These patterns bring the enjoyment of outdoor adventures into your home with picturesque wildlife dinnerware. Regardless of your taste in décor, you are sure to find patterns that fit into your theme in the selection of bird dinnerware. Whether you like dinnerware that feature life like patterns of birds, or prefer artistic depictions of birds, you can count on finding both when reviewing dinnerware patterns. 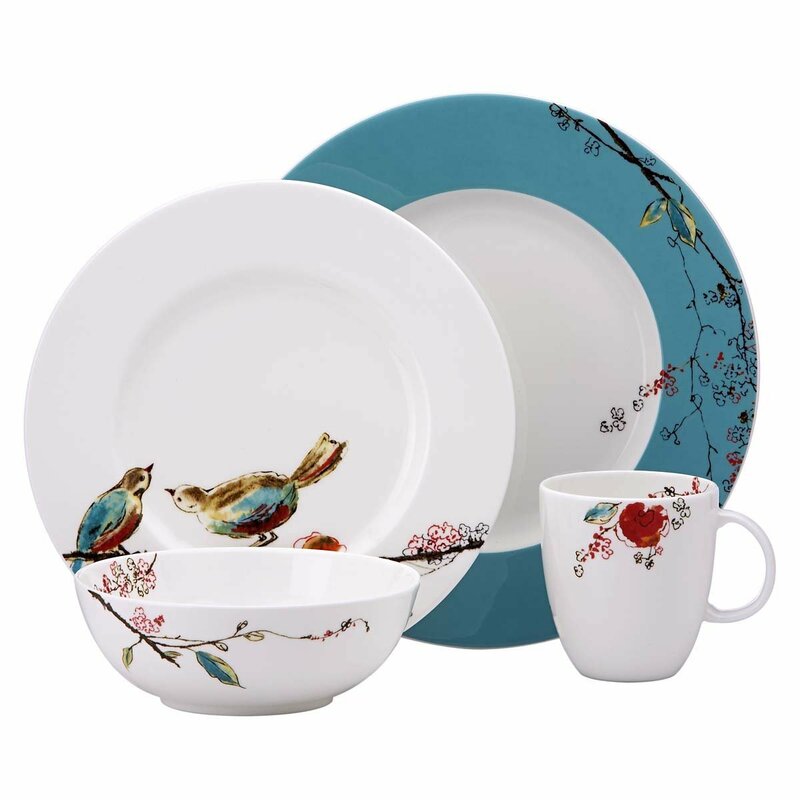 Songbirds, hummingbirds, owls, peacocks, cardinals, and bluebirds are welcome features to dinnerware patterns. My favorites include dinnerware patterns that feature peacocks, beautiful creatures, and I also have a bit of bias for hummingbirds and cardinals. My grandmother was a bird watcher and patterns like these remind me of her and the fascination that came from seeing and hearing birds enjoying nature. Wildlife patterns in the Spode Woodland Collection are pretty awesome. These dishes feature game birds such as pheasants, quail, red grouse, and mallard ducks. These remind me of outdoor adventures with my family, which is a big part of how we spend our time together. Birds are often presented in holiday dinnerware. Turkey dinnerware patterns are popular for Thanksgiving celebrations, of course. This majestic creature makes a wonderful presentation for Thanksgiving dinnerware. 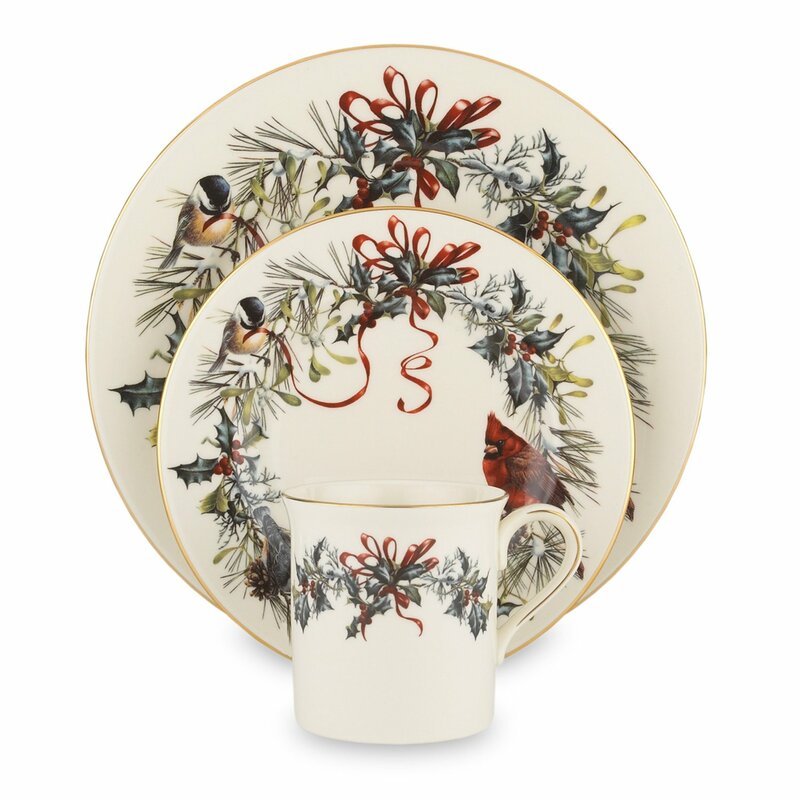 A lot of Christmas dinnerware patterns take advantage of beauty of birds in their design. One of my favorite Christmas dinnerware patterns is Winter Greetings by Lenox. It features beautiful cardinals amongst holly and bows. Tableware and accessories are also offered to complement this pattern which is a plus in my eyes. In dinnerware designs, birds are sometimes the feature of the pattern, while other times the birds are used to complement the design. In both cases, birds liven up the pattern and bring a bit of nature to the table. Birds can be the theme of your kitchen or dining room décor, or they can be complementary to the overall setting. At any rate, the choices are incredible when it comes to dinnerware with bird patterns.